Materials, methods and machines for forming permanent, directly-visible pictures in conformity with an original picture or document by using intermediate, i.e. latent, imagewise patterns. then such document should be classified in this subclass. In this subclass there two different main classification sections, namely the chemical or materials part and the method and apparatus part. Arrangements for scanning and reproduction of documents, in combination e.g. laser printer and electrographic copying machines, image data conversion: H04N. Arrangements for producing a permanent visual representation of output data, laser beam printer, image data processing: G06K. If a document describes non-invention information directed to process means for charging, exposing, developing transferring or cleaning an Indexing Code under an appropriate subgroup of G03G 2215/00 or G03G 2221/00 should be given. "electrographic", "electrostatographic", "electrophotographic","photoconductive" and "xerographic"
"process cartridge or unit", "image forming cartridge or unit" and "developing cartridge or unit"
of a unit comprising both the photosensitive, latent image recording member and the toner developing means, although they quite often describe those units of an image forming apparatus only comprising toner developing means. Compounds for treating recording members, such as cleaning, reactivating, polishing or heating (G03G 5/005). Recording layers in a recording member such as charge receiving layers, photoelectret layers and photoconductive layers (G03G 5/02-G03G 5/05). Other layers in a recording member such as bases (supports), intermediate layers and cover (protective) layers (G03G 5/10-G03G 5/14). Coating methods of the different layers (G03G 5/0525). Selection of specific materials in said layers such as macromolecular bonding materials (G03G 5/0528), photoconductive material (G03G 5/06- G03G 5/08) and sensitizer or activators (G03G 5/09). Charge-receiving layers combined with additional photo-or thermo-sensitive layers (G03G 5/153). Layers for recording by changing magnetic properties (G03G 5/16). Documents essentially dealing with the mechanical aspects of the recording member are classified in G03G 15/00 and G03G 21/00. Documents dealing with addition and condensation polymers per se are classified in C08L, C08G, C08J, C08F. Documents dealing with the pigments and dyes per se are classified in C09B, C08K. Materials, fluid or solid compounds used from treating the recording members: for cleaning, reactivating or polishing. Recording layers others than photoconductive layers such as dielectric layers or photoelectret layers. This sub group is further subdivided according to the different resins in the charge-receiving layers and other components. G03G 5/0205 covers said charge-receiving layer comprises polymeric components. G03G 5/0208 said polymeric components are obtained by reactions only involving carbon-to-carbon unsaturated bonds. G03G 5/0211 said polymeric components are obtained otherwise than by reactions only involving carbon-to-carbon unsaturated bonds. G03G 5/0214 charge-receiving layer containing organic non-macromolecular components, such as wax, fatty acids, pigments. G03G 5/0217 charge-receiving layer contains inorganic components, such as inorganic filler, silica. G03G 5/022 covers a recording layer which is a layer for surface-deformation, e.g. frost imaging: comprising the method steps: - (a) uniformly charging the layer to below the threshold which produces frosting when heated without exposure to light; (b) image wise exposing the layer after completing the charging; (c) heating the layer using a flat, radiant heater, the heating being carried out towards the end of but within the image wise exposure period, which causes positive to positive imaging. The low charging voltage reduces damage to the recording layer during repeated imaging cycles. G03G 5/024 covers a recording layer which is a photoelectret layer: comprising magnetic components with phase transition or functions as a photoelectret. The particles are able to line up in filaments with their dipole moment oriented along the lines of magnetic force at right angles to the surface of the carrier. The softening temperature of the binder is lower than the temperature of recording. G03G 5/026 covers a recording layers in which during the irradiation a chemical reaction occurs, whereby electrically conductive patterns are formed in the layers, e.g. chemixerography. G03G 5/028 recording layers in which after being exposed to heat patterns electrically conductive patterns are formed in the layers, e.g. thermo xerography. Documents dealing with binder resins and additional non polymeric compounds should be classified in both corresponding subgroups. 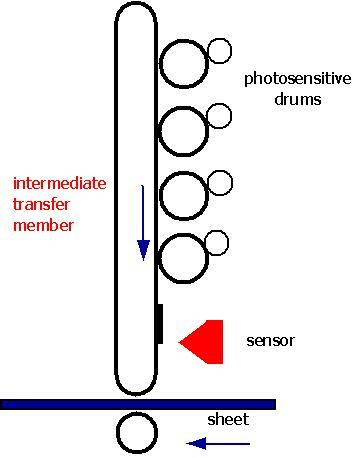 Image-recording layers that contain photosensitive components; the particular types of photoconductive recording layers, i.e. dual layers including separate charge-generating layers and charge-transporting layers; single photoconductive layers and additives and binders used in such photoconductive layers. This sub groups is further subdivided according to the structure of the layers and the chemical composition. G03G 5/043 photoconductive layers characterised by having two or more layers or characterised by their composite. This subgroup should only contain documents characterised by the structure of the layers. Structure in general would also cover single layer or multilayers. The last place rule applies. G03G 5/0433 all photoconductive layers being inorganic, i.e. the photoconductive agent (and if present) the bonding material being inorganic, the bases for the photoconductive layers however may be of any material. G03G 5/047 characterised by the charge-generation layer or the charge transport layer, e.g. a particular selection of charge generation material (e.g. phthalocyanine pigment) and charge transport material (e.g. triphenylamine). G03G 5/0433 and G03G 5/0436 take precedence. Organic (polymeric) bonding material employed in an electrophotographic photoconductive layer, in particular in a charge transporting layer and charge generating layer or in a single photosensitive layer and the method for coating a substrate with a photoconductive layer. It also includes inert supplements, e.g. an inhibitor or filler; which do not function as an active component in the photoconductive layer. G03G 5/0503 inert supplements not functioning as photoconductive material, resins or colorants in the photoconductive layer (not further specified): might function as inhibitor or filler in the photoconductive layer. G03G 5/051 organic non-macromolecular compounds. G03G 5/0514 not comprising cyclic groups. G03G 5/0517 comprising one or more carbocyclic groups consisting of carbon-to carbon atoms only. G03G 5/0521 comprising one or more heterocyclic groups. G03G 5/0525 coating methods of a photoconductive layer; coating methods such as dip coating, conventional thermal coating, spraying. G03G 5/0589 - G03G 5/0596: polymers in the recording layer characterized by the chemical or physical properties. Polymers characterised by the composition and physical or chemical properties should always be classified in both: the composition groups G03G 5/0532 - G03G 5/0589 and as well in the parameter-groups G03G 5/0592 and G03G 5/0596. Polymers with photoconductive side chains or end (terminal) groups should only be classified in G03G 5/07. Documents in which the recording member in general is characterised by chemical or physical properties caused by the binder resin should also be classified in G03G 5/0589 - G03G 5/0596. Organic and organo-metallic non-polymeric photoconductive compounds in a photosensitive layer (double layered photosensitive layer comprising charge transporting layer or charge generating layer or single-layered photosensitive layer including charge generation material and charge transporting material). G03G 5/0601 Acyclic or carbocyclic compounds (which are not further specified): any (substituted) non-hetero cyclic compound such as aromatic rings, aliphatic rings. G03G 5/0605 carbocyclic compounds with halogen groups substituted to ring. G03G 5/0609 any carbocyclic with an oxygen-containing functional group, such as keto- ketal- carboxylic acids, aldehydes, alcohols, anhydrides. G03G 5/0611 Squaric acid: also called as quadratic acid, because its four carbon atoms approximately form a square, C4H2O4. G03G 5/0614 containing any non-heterocyclic compound substituted with prim., sec. or tert. amino; e.g. triphenylamine. G03G 5/0618 any non-hetero cyclic compound substituted with oxygen and nitrogen; e.g. (di-)cyano-, urea, nitro-, amido-substitution. G03G 5/062 any non-hetero-cyclic compound substituted with non-metallic elements, such as Si (other than H, Hal, O or N). G03G 5/0622 any aromatic ring not covered by G03G 5/0624 - G03G5/06D4D. G03G 5/0624 containing one single hetero ring in the compound. G03G 5/0644 containing two or more hetero rings in the same compound. G03G 5/0646 containing two or more hetero rings in the compound in the same ring system including all cyclic rings - also the carbocyclic elements and the heterocyclic elements of the ring system, e.g. quinacridone. Ring system of at least two hetero-rings, further divided by the number of all rings, including also the non-heterocyclic rings. For example, perylene. G03G 5/0661 containing two or more hetero rings in the compound in different ring systems each system contains at least one hetero ring, e.g. oligomers of quinacridones. G03G 5/0662 any organ metallic non-macromolecular compound that contains metal elements [N. note alcoholates, phenates or organic acid salts of alkali or alkaline earth metals are classified as parent compounds, e.g. organometallic dyes should be classified in G03G 5/0664]: e.g. zirconocene. G03G 5/0664 Dyes, should be regarded in a more general meaning, i.e. a compound in a photoconductive layer that function as a photosensitive material, not only restricted to colouring agents. G03G 5/0666 dyes containing a methine or polymethine group in the compound; in case the polymethine is located between two or three azo groups classification is made in the last appropriate place, document should only be classified in G03G 5/0683 or G03G 5/069. G03G 5/0668 dyes containing only one methine or polymethine group. G03G 5/067 dyes containing only one methine or polymethine group and one or more hetero ring(s). G03G 5/0672 dyes containing two or more methine or polymethine group. G03G 5/0674 dyes containing two or more methine or polymethine group and one or more hetero ring(s). G03G 5/0681 diazo dyes containing hetero rings between the azo groups. G03G 5/0683 diazo dyes containing polymethine or anthraquinone groups between the azo groups. G03G 5/0685 diazo dyes containing hetero rings between the between the azo groups. G03G 5/0688 trisazo dyes containing hetero rings between the azo groups. G03G 5/069 trisazo dyes containing polymethine or anthraquinone groups between the azo groups. G03G 5/0694 azo dyes containing more than 3 azo groups in the compound. G03G 5/0696 phthalocyanine dyes: documents dealing with other dyes which are structurally very similar to phthalocyanine dyes such as naphthocyanines or phorphorines or the like should also be classified in this group. G03G 5/0698 any photosensitive agent in a recording layer of unspecified structure characterised by a substituent, such as a charge carrying agent. G03G 5/071 macromolecular photoconductive compounds obtained by addition polymerisation. G03G 5/073 polyaddition photoconductive resin comprising as a photoconductive substituent a carbazol group. G03G 5/075 macromolecular photoconductive compounds obtained by condensation polymerisation. G03G 5/076 polycondensation photoconductive resin comprising as a photoconductive substituent a group in the polymer backbone. G03G 5/078 polysilicone photoconductive resin; any type of silicon-containing polymer. Documents containing a photoconductive resin in an additional surface layer or intermediate layer should also be classified in G03G 5/07. Any type of inorganic photoconductive compounds in the recording layer of the photo drum. G03G 5/082 inorganic photoconductive agents which are not incorporated in a matrix of polymeric resin. The complete photoconductive layer is obtained by vacuum deposition, no binder resin is present. G03G 5/08207 selenium based photoconductive agent. 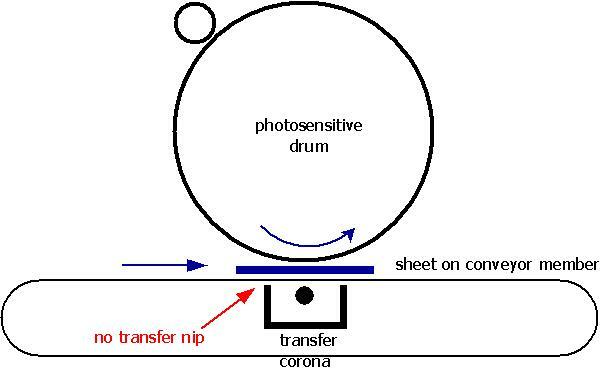 G03G 5/08278 preparation process of said inorganic photosensitive layers: depositing methods. Deposition method defines silicon-based photoconductive layer. G03G 5/08285 carbon-based photoconductive agent; in case C is mixed with Si in the photosensitive layer, document should be classified in G03G 5/08214. G03G 5/085 the photosensitive layer contains inorganic photoconductive agents in an inorganic matrix, such as glass-like layers, ceramic layers or the like. G03G 5/087 the photosensitive layer contains inorganic photoconductive agents in polymeric binder matrix. Any compound which activates or sensitizes the photoconductive material in the photosensitive layer. Said compounds which activate or sensitize the photoconductive material in the photosensitive layer: dyes which are sensitising agents for different light bands such as a pigment sensitizing dopant having an electron acceptor molecule or near infrared absorbing materials. Substrates for image recording members. G03G 5/101 covers paper; G03G 5/102 covers metal substrates such as gold or aluminium; G03G 5/104 covers substrates comprising inorganic compounds such as carbon nanotubes, salts, metal oxides or carbon black; G03G 5/105 any electrically-conductive macromolecular compound, such as ionic cellulose derivatives (last place rule applies); G03G 5/107 cationic electroconductive polymers, such as quaternary ammonium polymers; G03G 5/108 anionic electroconductive polymers, such as those containing carboxylic acid. Image recording members used in electrophotographic multi-colour processes using two or more colours (developing agents). Electrophotographic imaging members with photoconductive layers sensitive to red, green and blue light, accomplished with several different photoconductive layers or with a single panchromatic photoconductive layer using a green-, blue-, red- and white-filter. This group is not used for classification. Intermediate layer, subbing layer, undercoat layer or inner layer - located between the substrate and the photosensitive layer and cover layer, top layer or protective layer - coated on top of the charge-receiving layers. Intermediate layers that are not photoconductive layer or back layer or subbing layer. Intermediate layers comprising inorganic compounds or organo-metallic compounds. Layers on top of the photoconductive layer(s): protecting layer, top layer, coating layer. The polymers in the cover layers are further subdivided according to addition polymerisation and condensation polymerisation material-groups G03G5/147B - G03G5/147D2D16 and according to the properties in the parameter-groups G03G5/147D2H and G03G5/147D2K. Documents dealing with specific polymers not only defined by composition but also by the properties should be classified in both groups: composition group and parameter group. Protective layers which does not only function as a protective layer but also as a photoconductive layer should be classified in G03G 5/05, G03G 5/07. Charge receiving layers which are combined with other photosensitive or thermo-sensitive layers; providing localised heating to a medium comprising a thermally-activatable component of an imaging forming system or to a photoconductive layer system a light-sensitive layer is added. Magnetic recording layers in an imaging element composed of magnetic particles which changes the magnetic properties during recording process. Image-receiving members in electrophotographic imaging in processes and the manufacturing thereof. This subclass is further subdivided according to the different types of layers: cover layers, intermediate layers, back layers and substrates and their chemical composition. G03G 7/0053 Intermediate layers for image-receiving members. G03G 7/0093 Image-receiving members based on materials other than paper or plastic sheets, e.g. textiles, metals, ceramics, CD or DVDs. Top layers covering the final printed image receiving member, e.g. for protecting, for writing thereon. Method of generating simulated photographic-quality images by providing a protective layer on the printed image are classified in G03G 15/00. Developing agents such as magnetic, encapsulated, and liquid toners for developing electrostatic images; to include their components, such as binders, colorants or dyes, plasticisers, carrier particles, charge control agents and compositions, properties, and manufacture thereof. However liquid developers should be classified in G03G 9/12. Toner particles are classified in subgroup G03G 9/08 and further subdivided according to their preparation method for producing, their chemical composition and their properties and components. G03G 9/0802 Preparation method for producing the toner particles. G03G 9/0806 chemical synthesis of at least one toner component (e.g. polymeric binder) takes place during the toner preparation process, in situ. G03G 9/081 reactive mixing of the toner components in a liquefied state, melt kneading, reactive mixing with a co-extruder. G03G 9/0819 characterised by the dimensions of the toner particles, such as particle size and particle size distribution. G03G 9/0821 characterised by the physical and chemical parameters of the toner particles, in case the toner parameters are caused by the toner binder resins the document should be classified in G03G 9/08795, G03G 9/08797. For magnetic parameters the document should be classify in G03G 9/083. In case the toner parameters are clearly caused by the toner colorants, classify only in G03G 9/0926. G03G 9/0825 characterised by the structure of the toner. However encapsulated toner comprising core-shell structure should be only classified in G03G 9/093. G03G 9/0827 characterised by the shape of the tonner such as degree of sphericity, shape factor SF1, SF2, roundness, needle like shape, potato like shape, lamellar shape. Physical properties of the magnetic components in the magnetic toner should only be classified in G03G 9/0835 - G03G 9/0839. In G03G 9/0836, examples of other physical properties of the magnetic toner covered in this group include electrical properties, true density, and apparent density. Specific properties of the magnetic toners, relating to the shape are covered in G03G 9/0837 and to the particle size in G03G 9/0839. These shape-properties and particle size properties are consequently excluded from G03G 9/0836. Documents relating to a process for manufacturing of a magnetic toner exhibiting the said qualities should be classified in the corresponding method classes (i.e. G03G 9/0802 to G03G 9/0817, which consist of toners in general: magnetic and nonmagnetic toners) as well as in the properties groups of magnetic toners. Moreover the classifier should also classify the binder resin, the colorant, the plasticisers and charge control agents of a magnetic toner according to G03G 9/087, G03G 9/09, G03G 9/097. Binders for the toner particles are classified in G03G 9/087 which is further subdivided according to the chemical composition subgroups of addition polymerisation polymers covered by G03G 9/08702 and which is further subdivided and condensation polymerisation polymers covered by G03G 9/08742 and which is further subdivided and natural polymers covered by G03G 9/08775 and which is further subdivided and the parameter sub-groups G03G 9/08786 - G03G 9/08797. The classifier should bear in mind that he should classify the document dealing with a toner binder resin not only in the material groups but also in the parameter groups. If a coloured compound only functions as a CCA, then it should only be classified CCA groups. Colouring agents of toner particles are classified in G03G 9/09. Note: colouring agent is meant to be interpreted as any photosensitive active agent. In case the photosensitive agent is defined by its chemical composition it should be classified in G03G 9/0902 - G03G 9/0922. In case the photosensitive agent is defined by a specific substituent it should be classified in G03G 9/0924. 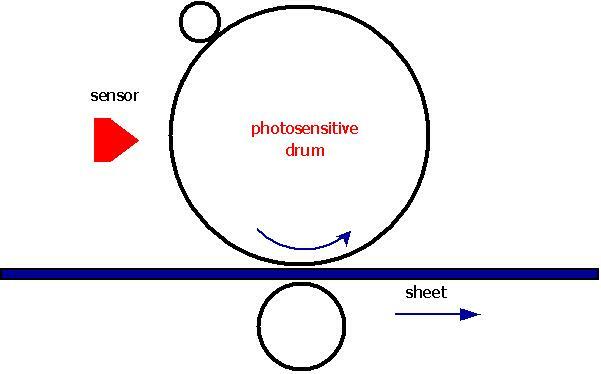 In case the photosensitive agent is defined by physical or chemical properties other than colour, e.g. encapsulated pigment shape or dimension it should be classified in G03G 9/0926. Compounds that are capable to generate colouring agents by chemical reaction, such as precursor, leuco dyes should be classified in G03G 9/0928. Encapsulated toner particles are classified in G03G 9/093. This subgroup covers all toner particles which comprise the specific structure of a core and a shell. The classifier should bear in mind that coated toner particles should however classified in G03G 9/113 . G03G 9/09307 - G03G 9/09342 includes toner particles relating to specific shell polymers and as well inorganic and organic particles in said shell. The classifier should bear in mind that these particular shell polymers should not be classified in G03G 9/087. G03G 9/0935 - G03G 9/09385 include toner particles relating to specific core polymers and as well inorganic and organic particles in said core. The classifier should bear in mind that these particular core polymers should not be classified in G03G 9/087. G03G 9/09392 includes the preparation method of said encapsulated toner particles. Note: please do not classify the preparation method of an encapsulated toner in G03G 9/0802 - G03G 9/0817. This group is subdivided according to inorganic compounds G03G 9/09708, organic compounds G03G 9/09733 and organo-metallic compounds G03G 9/09783. In the subgroups G03G 9/09741 and G03G 9/0975, the classification is done for the part of the charge control agent that provides the charge controlling property, e.g. an oxy carboxylic acid (-) metal (+) complex functions as a negative charge control agent and is classified in G03G 9/0975 and a quaternary ammonium (+) salts (-) functions as positive charge control agent and is classified in G03G 9/09741. Silica particles which are treated with organic compounds should be classified in both subgroups G03G 9/09716 and G03G 9/09725. Carrier particles of dry developers are classified in G03G 9/10. Note: magnetic particles in toner particles as classified in subgroup G03G 9/083 are not carrier particles. G03G 9/1075 includes magnetic components that are coated with any material. G03G 9/113 includes all different types of coating material covering a magnetic carrier core or a non-magnetic carrier core. G03G 9/1131 - G03G 9/1139 includes all the different types of resins and as well inorganic and organic components of the carrier coating. G03G 9/1131 covers the coating methods of coated carriers, which can be coated or encapsulated as one very specific example of coating, and as well it covers the structure of said coatings of said carrier particles, such as uniformity or porousity. The head group G03G 9/00 developers – includes all types of developers comprising all types of toner particles and all types of carrier particles. Last place rule applies. Coated carriers should not be classified in G03G 9/00. G03G 9/12 is further subdivided according to the components of the liquid developer: colouring agents G03G 9/122, liquid (carrier) G03G 9/125, polymer component G03G 9/13 and stabiliser/ charge controlling agent G03G 9/135. G03G 9/16 Developers such as solutions, aerosols and electrodeposition solution which are not provided in any of groups G03G 9/06 - G03G 9/135. G03G 9/18 Developers which are considered as differentially wetting liquid developers such as ejected droplets. Substances included either in toner particles or being present as an additional compound which are fixing a toner to a permanent image receiving member. which means that a printing master plate for electrophotographic engraving is formed by forming the photoconductive layer containing a photoconductive compound and binder resin on a conductive base, subjecting the photoconductive layer to image exposing, and forming a toner image thereon, then removing the photoconductive layer of non-image parts except the toner image part thereby forming the printing plate. The functional groups incorporated into the polymer contained in the binder resin of the photoconductive layer of such printing master plate form at least one hydroxyl group and at least one carboxyl group by decomposition. This group is further subdivided according to the different purposes of said printing masters, i.e. for planographic printing plates G03G 13/28, in particular which are obtained by a process including the transfer of a toner image (direct process) G03G 13/283, for dry lithography G03G 13/286, for hectographic masters G03G 13/30, and relief printing plates G03G 13/32. Apparatus and means for controlling and regulating the different parts of the electrographic copying machine. This main group covers also processes in so far as they are characterised by the use or manipulation of apparatus classifiable per se in this group. Colour copiers. All aspects directly related to the formation of multi-colour copies using an electrographic image forming machine are classified here and in the respective sub groups of G03G 15/01 generally according to details according to exposure, development, transfer and the general structure of the machine. Subgroups G03G 15/60, G03G 15/65, G03G 15/70 mainly contain documents concerning details which are also classifiable in more general classes, e.g. G03B, B41, B65H. There is overlap between the groups G03G 15/01 for colour copiers and the respective groups for mono-colour copiers: G03G 15/50 (control), G03G 15/04 (exposure), G03G 15/06 (development) and G03G 15/14 (transfer). Detection of toner image or test patch on an intermediate transfer member is classified in G03G 15/0131 and G03G 15/5054. Driving problems during the use of an intermediate transfer member are classified in G03G 15/0131 and G03G 15/1615 . In patent documents the following expressions/words "intermediate transcription / transfer member" , "second transcription / transfer member" and "middle - transcription / transfer member" are often used as synonyms for a toner image carrying member receiving a toner image from the electrographic recording member (= 1st transfer) and the transferring the image to the final recording material (2nd or final transfer). In patent documents such expressions are often used instead of the wording "second base" which is used in the classification scheme of this group. Details of colour developing unit; however rotating set of developing units are classified in G03G 15/0173 or G03G 15/0184 depending on the general structure of the apparatus. Apparatus using a single reusable electrographic recording member onto which the mono-colour toner images are superposed before common transfer from the recording member. Charging means for charging the photosensitive recording member, e.g. roller, brush, corona. Arrangements for cleaning and maintenance of charging apparatus and the control of charge. Proximity charging means forming microgap like a charging roller held in small distance from surface to be charged e.g. by spacers, but not coronas. Illuminating systems, light sources and optical elements provided for projecting or exposing the original image onto the photosensitive recording member in order to form the latent charge pattern by charging the recording surface at distinct portions. 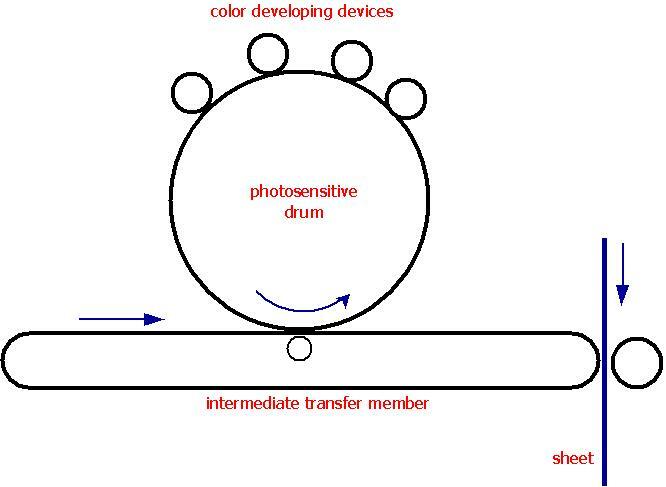 The sensitizing light hereby is either reflected from the original image and directly projected onto the photosensitive surface or it is light e.g. originating from a laser which corresponds to the original image data as received from other sources like a scanner (digital copiers) or from computer modified/generated image data and is exposed onto the photosensitive surface. Arrangements for exposing the image information provided otherwise than by directly projecting the original image onto the photosensitive recording material, i.e. digital copies. Details of the projection optics relating to variable magnification: G03G 15/041 takes precedence. Means for controlling illumination or exposure e.g. by optical elements, but directed to variable magnification: G03G 15/043 takes precedence. Exposure from behind the photosensitive surface, e.g. 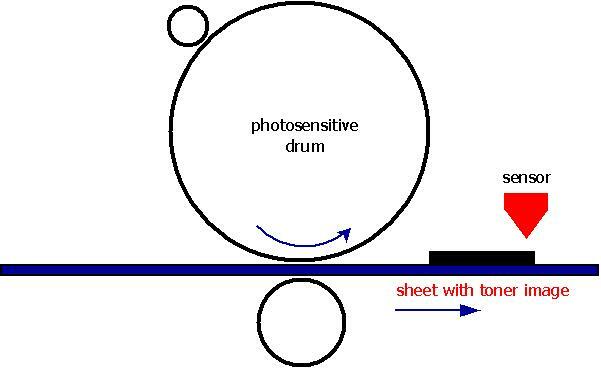 exposure from inside a photosensitive drum. Means for charging or discharging distinct portions of the charge pattern on the recording material, e.g. for contrast enhancement or discharging non-image areas. Means for forming composite images, e.g. image editing: G03G 15/36 takes precedence. Means for eliminating residual charges on the photoconductor: G03G 21/06 takes precedence. Arrangements and means for developing the latent charge pattern recorded on a photosensitive surface using a solid powder developer (toner). developer or toner for the developing agent. However sometimes "developer" is also used for the developing unit as whole. Means for developing a latent image by cascading, old technique. 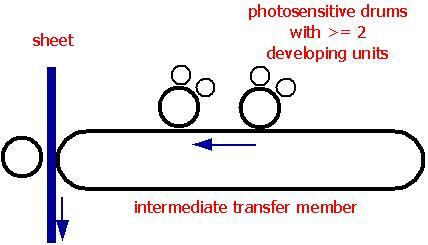 Means for developing a latent image in a powder cloud. Development using a brush; however developing means using magnetic toner brushes are classified in G03G 15/09, G03G 15/095. The most common development means is donor element, normally a roller or a belt. All means in direct functional relation or contact to the donor element, e.g. a toner supply roller (= roller for applying the developing agent to the donor element), a doctor blade, distance holders, toner recovery and cleaning of the donor member and the structure of the donor member itself are classified here and in the respective subgroups of G03G 15/0806. Means for developing a latent image through immersion, old technique. Arrangements for supplying fresh developer, e.g. toner cartridges. Means for conditioning developer in the developing unit and removing old developer therefrom. Testing means for the developing agent. Arrangements for purging used developer from the developing unit, i.e. removing used and deteriorated developer to the outside of the unit. Arrangements for testing or measuring developer properties or quality, e.g. developer level, concentration, charge, size or flowability. Monitoring means for toner consumption: G03G 15/556. Arrangements for supplying new developer, e.g. a detachable developer cartridge. Also stirrer, agitator provided in the cartridge. The interface between the developer cartridge and the developing unit. Arrangements for metering and dispensing developer from a developer cartridge into the development unit, i.e. all the means provided at the interface between a (detachable) toner cartridge and the developing unit, e.g. conveyor screws, seals. Managing developer material inside the developing unit. Arrangements for conveying and conditioning developer inside the developing unit, e.g. agitating, removing impurities or humidity, e.g. augers, stirrer. The "second base" is either an intermediate transfer member (transfer onto and from the intermediate transfer member e.g. in colour machines) or the final recording medium (transfer from the photosensitive member e.g. onto the recording sheet in a nip). In patent documents the following expressions/words "intermediate transcription / transfer member", "second transcription / transfer member" and "middle - transcription / transfer member" are often used as synonyms for a toner image carrying member receiving a toner image from the electrographic recording member (= 1st transfer) and the transferring the image to the final recording material (2nd or final transfer). In patent documents such expressions are often used instead of the wording "second base" or "intermediate support" which is used in the classification scheme of this group. Driving mechanism e.g. gears, couplings, belt tensioning: G03G 15/1615 . Details: e.g. chemical composition: G03G 15/1615. The detection of a toner image or of a test patch on an intermediate transfer member e.g. for development and colour registration control is classified in G03G 15/5054 and G03G 15/0131. Transfer onto other materials than paper, e.g. OHP, but not to an intermediate transfer member. Special recording materials and substrates: G03G 15/6591. Fixing by heat is mostly combined with pressure pressure in the nip between a contact heating element and an opposing pressure element. "eddy current heating", "induction/ electromagnetic / magnetic heating" and "magnetic flux heating"
Arrangements and processes which involve the combination of more than one step of charging and imagewise exposing, developing a latent charge pattern and transferring and fixing of the developed toner image. Means directed to the general control of the image forming apparatus, e.g. regulating different parts of the machine, multimode copiers, microprocessor control (sequencing control: G03G 21/14). Processes and methods directed to control the apparatus. Means and apparatus for handling the final recording material inside the apparatus and in post-processing devices. Electrographic processes using deformation of thermoplastic layers. Electrographic apparatus and processes using an electric conductivity pattern; radiation field photography, e.g. Kirlian photography, colour-discharge photography (G03G 17/005); electrolytic development (G03G 17/02); photoelectrophoresis (G03G 17/04); using migration imaging (G03G 17/10). Processes for producing patterns which are not produced by charge pattern, which is done by chargeless electrophotography, the process to produce an optical image involves electrolytic development. processes for producing patterns which are not produced by charge pattern , the process involves photoelectrophoresis using a photoconductive element; an colloidal liquid is applied to one surface of a photoconductor while the optical image is focused on the opposite side. Devices that are suitable for providing processes for producing patterns which are not produced by charge pattern. Processes for producing patterns which are not produced by charge pattern using an electrophoto-adhesive process such as manifold imaging, which means a selective removal of the photoconductive material of the fracturable photoconductive layer by adhesion. Processes for producing patterns which are not produced by charge pattern using migration imaging such as photoelectrosolography. Electrographic apparatus and processes using magnetic patterns, magnetography; selective demagnetizing (G03G 19/005). cleaning of the photosensitive member. 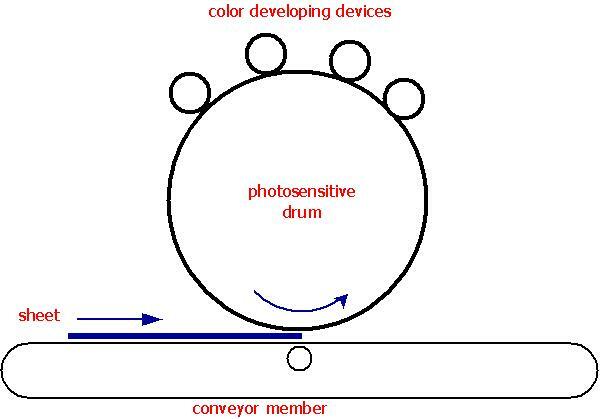 conditioning of the photosensitive member e.g. lubrication. collection and storage of waste toner. counting and billing of copies. control of the inner apparatus environment. Mechanical means for facilitating the maintenance of the apparatus, e.g. modular arrangements (G03G 21/16) or modular arrangements using process cartridges (G03G 21/18). 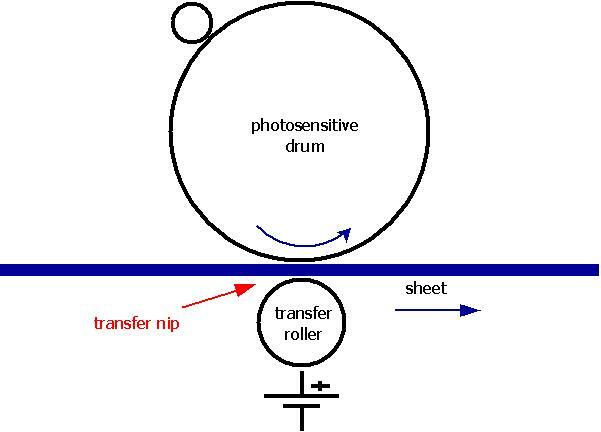 All arrangements with respect to the outer and inner structure of an electrophotographic apparatus, like modular arrangements, cartridges, frame and door structures. Process cartridges for electrophotographic image forming apparatus. A process cartridge comprises at least two image processing means provided in a single mostly detachable unit or frame. 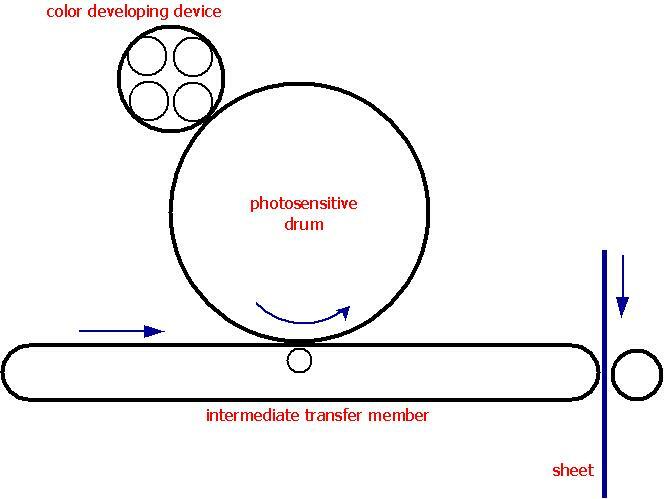 Most of the process cartridges comprise the photosensitive member and at least one image processing means selected from charging means, developing means, transfer means or cleaning means. However there a process cartridges, which do not comprise a photosensitive member but more than one image processing means. These units are classified in group G03G 21/1835 (precedence). A developing cartridge, when it's adapted to be fit into a separate photo drum cartridge, is seen as a sub module of a process cartridge that does comprise at least two image processing means, and therefore it can be classified in this group. Means for handling the process cartridge in the apparatus body; details about interactions between the cartridge and the main machine, except for those that go under G03G 21/1875; mostly, it's about guiding the cartridge in and out of position and providing drive and electrical power to it.